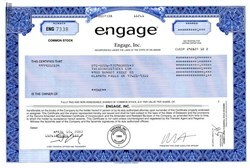 Engage, Inc. provided advertising, marketing, and promotion management software solutions for retailers, newspapers, agencies, and corporations. Its solutions combined workflow automation with digital asset management technology to streamline the creation, approval, production, and re-purposing of advertising and other marketing material. Additionally, the products enable Web publishers, advertisers, and merchants to target and deliver advertisement, content, and e-commerce offerings to their audiences. The solutions contain additional features, such as Internet-based approvals, promotional planning, and digital pre-flighting. Engage's professional services provided design and implementation, training, and project management services. It also provided maintenance and support services to software customers. These services include software version updates, as well as telephone and on-site support. The company offered support services, including a customer call center and a dedicated technical support Web site.